The Killer Whale has long been a staple of many aquatic-themed amusement parks. Millions of people watch as they perform stunts with human trainers. As with any animal that has been taken from the wild with the intention of performing, however, there is a great deal of controversy surrounding the practice. But while there are negative effects on the animals, there are misconceptions as well. The first recorded instance of a killer whale being taken from the wild and placed in an amusement park was 1964, in Vancouver, Canada. In the decades that followed, more than 100 whales were taken from the Pacific Ocean for similar purposes. In the mid-1980s, controversy arose over the treatment of these animals and he methods in which they were taken from their homes. 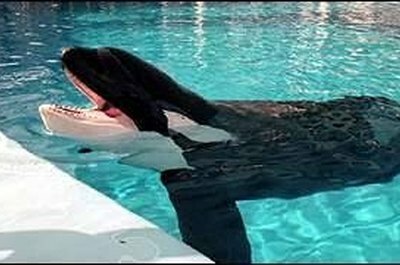 Since then, killer whales have been bred in the wild with the purpose of being amusement park attractions. Despite this, they are still an endangered species. Killer whales are major attractions at theme parks such as Sea World. Because of their intelligence and general playful nature, they are often trained to perform stunts. Whales are known to perform jumps and flips, as well as shooting their trainer high into the air and back down into the water again. The effects of a killer whale in captivity can be debilitating. Aside from a decreased lifespan, one negative effect is dorsal fin collapse. An estimated 60 percent to 90 percent of all killer whales in captivity suffer from this ailment, which is when the main fin on their backs no longer stands upright and instead curves part, or all of the way, to either side. This is because they can no longer swim strong for long distances, thus weakening the fins. A common misconception about killer whales in captivity and of the species in general is that they are prone to attack humans. In reality, there have been very attacks ever reported. In many cases, it involved a human swimming and splashing around in waters inhabited by seals, which the whales eat. This caused the humans to appear as seals from the perspective of the whale, which made them try to attack. In most cases, once the beast realized exactly what it was after, it backed off. The average lifespan for killer hales in the wild is around 50 years for females and 30 years for males. Though generally well-cared for in captivity, there are still unavoidable, negative effects on their lifespan. Of the almost 200 whales taken into captivity since the 1960s, almost 75 prcent have not lived more than 10 years. Fewer than 20 survived longer than 15 to 20 years. Only two have survived anything close to their normal lifespan.